1. Log in to a guest session. 2. At a terminal, enter: notify-send -i face-smile "Title text" "Body text"
* "The title should be the standard application font size"
* "The body should be 0.8 × the standard application font size". * The body text is too large too. I fixed several things in the pixels-per-em calculation (there should be no more rounding errors) and I set the factors for title- and body-text back to 1.0 and 0.8. With that this (see attachment) is what I get from your example. I'm not sure what I should regard for text-height there. The l, i or T or G.
In that screenshot I use "Sans 10" and a DPI of 100. 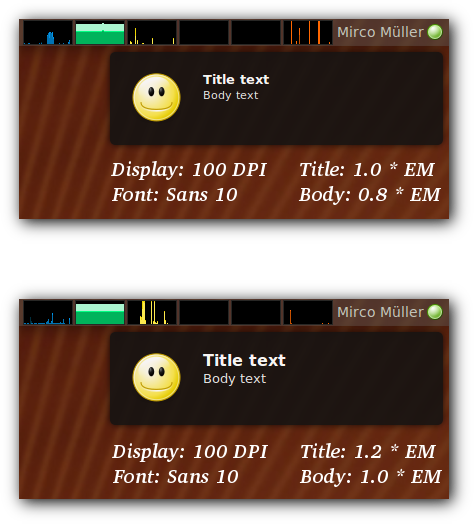 Bubble title-text size is 1 EM and body-text size is 0.8 EM. > ** Attachment added: "comparison between 1.0/0.8 and 1.2/1.0"
Mirco, to make the notification bubble text fit with the text in the rest of Gnome, Notify OSD needs to use the same DPI value as the rest of Gnome. Currently Gnome is hard-coded to 96 dpi, though that is likely to change to the Xorg-supplied value during Karmic. Notify OSD needs to keep in sync with that calculation, i.e. hard-code 96 dpi whenever Gnome is doing so. Until you do that, neither of the font size choices -- 1.0✕ and 0.8✕, or 1.2✕ and 1.0✕ -- will match up with the rest of Ubuntu. Having installed this fix, I would say that the font size is now too small by default - before I would have described it as well proportioned for its purpose, now it is excessively small. I note that the motivation for the change here was to comply with specs, not responding to user complaints from notify-osd as deployed in Jaunty. I would suggest that making the body text *smaller* than the default application font size, for a bubble which the user must read quickly before it disappears, is a poor choice. Perhaps switching to 1.2x/1.0x would be a good first step. @ Max Bowsher, thanks for your comment, but there's not much point going back and forth with this issue like that. This bug has been fixed, if in your opinion the font size is still incorrect, please do file a new bug.